Successfully Added HK Warehouse Android Smartphone Ulefone Power 2 - Dual-IMEI, 4G, Octa-Core CPU, 4GB RAM, 1080p, 6050mAh, 13MP Cam(Grey) to your Shopping Cart. Honoring its name, the Ulefone Power 2 is an Android smartphone that comes packed with exceptionally powerful hardware. Its Octa-Core CPU has been clocked at 1.5GHz, meaning it is capable of delivering a speedy performance. Built for speed and energy efficient usage, this processor lets you enjoy the latest and most demanding software without dropping a frame. Along with this powerful piece of hardware comes 4GB of RAM that gives the mobile phone an extra boost – allowing you to multitask and effortlessly use numerous of its applications at once without slowing down your Android device. With a stunning 64GB of internal storage and additional 256GB external memory support – this Android phone lets you save all your files, media, and more without you ever needing to worry about storage space again. This Android smartphone runs on an Android 7.0 operating system. As the latest Android OS, it is guaranteed to deliver a smooth performance that meets the likings of even the most critical mobile phone users. Access to the Play Store provides you with an unlimited pool of free entertainment for you to enjoy on the phone’s stunning 5.5-Inch display. Portraying all your favorite media in crisp 1080p resolution, this Android phone is guaranteed to treat you with breathtaking visuals and vivid color at any time of the day. 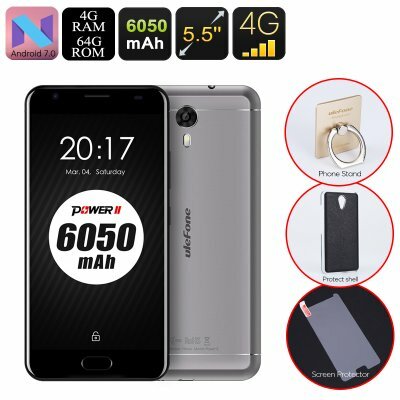 In order to let you fully enjoy the powerful performance this mobile phone has to offer, the Ulefone Power 2 Android phone packs a massive 6050mAh battery. Delivering up to 63 hours of continuous usage time and an unbelievable 75 days standby time – this mobile phone will not run out of juice anytime soon. When the Android phone is running low on power, all you have to do is hook it up to its adapter for 2 hours and, thanks to its quick charge technology, your phone will be powered up again in no time. Supporting two SIM card slots and Dual-IMEI numbers, this Android phone allows you to stay connected to two network providers at once. If you are often traveling abroad and like to access the internet at local fees, or if you simply like to be reachable on two different phone numbers while using one device, this Android phone is perfect for you. It furthermore supports 4G connectivity thanks to which it allows you to enjoy the fastest mobile data speeds out there. This gives you the possibility to browse the web at any time or to share the amazing pictures you took with the phone’s 13MP rear camera with friends and family back home.